The secret of the calendar (and eclipse prediction) is to be able to find the exact number of lunar months in the solar year. (Psst! – it’s 12.368, almost 7/19ths). The over-run is 0.368 of a lunation, which is 10.875 days. It is objectively true that the two main features of Stonehenge are built to the ratio 7/19. The Aubrey circle is 104 MY in diameter (283 feet), whilst the Sarsen circle has an outer diameter of 104 feet. The fraction is 0.367. This same fraction may be found from a rope marked with 30 equal divisions. Peg out a 5:12:13 triangle, divide the ‘5’ side into ‘3’ and ‘2’. At this 3:2 point, a constructed hypotenuse to the apex has a length of 153, which is 12.369 units. One could even use the station stone rectangle, where the divisions are eight Megalithic yards. I have called the construction the Lunation Triangle, as it appears not to have been discovered and named previously by modern culture. However, there appears to be a story containing the lunation triangle in the last chapter of St John’s Gospel. The Sarsen Stones were moved over 20 miles from the Marlborough Downs, adjacent to Avebury. The smaller bluestones came originally from Carn Menyn in the Preseli Mountains of West Wales. Some think they came by glacier, others that they were lugged to Milford Haven, then rafted. Recent Chlorine 36 analysis (Bowen, UCW Cardiff) favours human transport, and the glaciation of southern Pembrokeshire suggests it unlikely that the bluestones would have been carried towards the south-east. 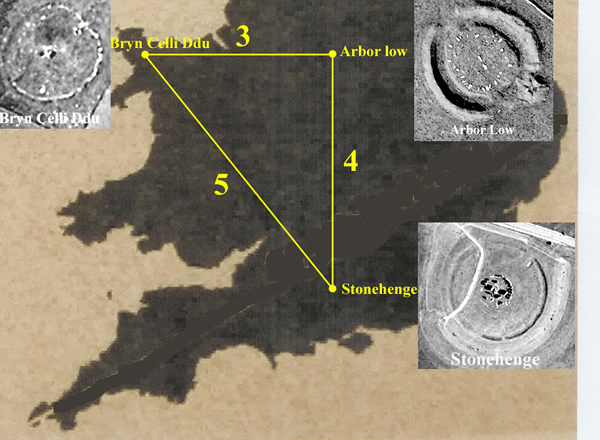 However, my argument is that the large altar stone at Stonehenge is made from a sparkly sandstone found adjacent to the Haven (at Cosheton) – did a glacier then transport it from sea level uphill to Salisbury Plain? It is thought very unlikely that glaciation reached to the Haven. Whatever this debate brings in the future, it is objectively true that the sarsens were moved by human effort and, as we shall now discover, it is not actually very improtant how the bluestones got to Stonehenge but why they assumed such importance. The original latitudes for the bluestones and the sarsens is 364/7 and 360/7′ degrees respectively. The centre of the henge at Avebury is placed exactly at 360/7 degrees, i.e. at one seventh of a circle as latitude. So exact is this figure that I suggest it was no accident or coincidence. The builders had a technique to calculate latitude to seconds of a degree. It is of note that the Sarsen circle may be precisely placed by constructing a seven sided star ( heptogram) from the Aubrey circle. The star-arms cross at 100.8 feet, the mean diameter of the Sarsen circle. (Figure 7.11, Sun, Moon & Stonehenge, page 137) Of course, we all know that the midsummer azimuth of sunrise is approximately a seventh of a circle and that Stonehenge’s actual latitude is within 15 minutes of a degree of a seventh of a circle. Every year, for about 34 days, the full and new moons occur near the Sun’s path (the ecliptic) and eclipses result. These two times, which are 173 days apart, move backwards around the calendar taking 18.6 years to complete a revolution. The precise two points where the moon crosses the apparent path of the sun through the zodiac ( the ecliptic) are called the lunar nodes. For the past twelve years I have been running a model of the ‘Aubrey Calendar’. It has predicted lunar and solar eclipses accurately to the day, shown instantly the position of the sun and moon against the stars, indicated lunar phase at a glance and, with a 24 hour clock placed in the centre, enabled the state of the tides to be known. My email address is skyhenge(at)zetnet.co.uk. You may order signed copies of the above books here. Please be brief. I am also able to undertake lecturing and demonstration seminars, based on a large collection of working and practically based models. In the first instance please inquire via the email address above. The History Channel TV prog said it was more likely that the solstice ceremony was midwinter not midsummer. Looking directly at the Sun is not too clever. @oldbrew quoted: solstice ceremony was midwinter not midsummer. Without the propaganda of TV ceremony masters, who have no authenticatable evidence, we have to look at the recurrence of lunstice (they are equinoctial). Then, between any two same-sort lunstices there’s a solstice, and the lunar inclination around these three pivotal points each exhibits a pattern (thesis-long draft omitted). Try it; here we cannot use wished-for ceremonial considerations but instead a precise observation schedule for naked eye observers (who know how to estimate 8 years diff and 3 years diff and 27 years diff configurations by using the fig. 3.6 Service Manual). The position of stone 56 is interesting. If they were counting apse cycles there would be 3 in 55.83 years. The writer doesn’t mention that as a reason why stone 56 is not aligned with the other 55. (Ball University did suggest apse cycles as the reason for the 56 stones). @oldbrew, from which direction did they experts look, from above down onto a 2D paper? B.t.w. this all is already very much blown up, let’s not exegete the advertizing book authors’ wishes. I for my part jibe with the long-term naked eyes observations of Robin Heath. OB: solstice ceremony was midwinter not midsummer. Looking directly at the Sun is not too clever. I’ve attended both, and found them both enjoyable and comfortably viewable experiences. The Summer solstice Sun usually rises out of mist a few degrees above the horizon. @ Chaeremon – that wasn’t a quote from Heath, it was from Tim Daw. OB: The position of stone 56 is interesting. If they were counting apse cycles there would be 3 in 55.83 years. The writer doesn’t mention that as a reason why stone 56 is not aligned with the other 55. Please can we look at the theory presented in this post rather than confusing the issue with someone elses? The 56 Aubrey holes are evenly spaced on a circle well outside the standing stones. They are the white dots on Tim Daw’s leaflet. see the figure with the seven pointed star in the post above. The problem was that you confused the 56th Aubrey hole with a stone well within the Aubrey holes circle. The Aubrey holes are not stones, and never contained stones. If this theory is correct, they probably contained gravel or sand movable markers could be set in temporarily. Where does that quote appear in the original post? I’ll save you looking, it doesn’t. That’s because ‘stone 55’ (and stone 56) are part of someone else’s numbering system, from a different study, that YOU linked. It is within the central part of stonehenge, which is well within the circle of 56 Aubrey HOLES which Robin theorises were used for the eclipse calendar..
OK, I didn’t realise Tim Daw’s set of 56 are not the ones Robin Heath is talking about. Btw I found something else by Richard and Robin Heath a while back called ‘Synchronicity of the Earth’s Rotation with the Moon’s Orbital Cycles and Solar Year’. Discussion of lunar nodes theories and others here. In 1966 Sir Fred Hoyle examined the arguments in favour of an astronomical purpose for the holes and concluded that the 28-day lunar cycle could still have been indicated by moving a marker stone representing the moon anticlockwise by two holes every day, ending up with 56 holes in total. By moving another marker anticlockwise two holes every thirteen days and which represented the Sun, an annual journey around the circle could also be made. Two further marker stones would also have had to be moved round three holes per year to represent the points where the moon (or rather its marker) crossed the Sun marker’s path. Hoyle proved that this could have been used to produce a much more reliable method of predicting eclipses as whenever the moon and sun markers are directly opposite each other and the other two stones occupy those same opposing points, an eclipse can be guaranteed. This also has the additional benefit of not needing any standing stones to be present at the site. OB: OK, I didn’t realise Tim Daw’s set of 56 are not the ones Robin Heath is talking about. Robin heath isn’t talking about stones. He’s talking about HOLES. They may have had stones or staffs placed in them temporarily as markers though. @oldbrew, we could/can agree with 56 and the eclipse theory as presented by Robin Heath, because all (most) evidence is not able to contradict this. I’m certainly satisfied since the Seth occurrence can have been a pivotal lunar eclipse in the middle between two lunstices (18.6 yr). Reading the wiki-pravda brainwash you mentioned, it always appears obvious that the referenced authors (and the pravda Kolkhoz) have no idea that the 18.6 yrs have +/- max inclination at one interval end when observing lunstices, and that’s the same thing as eclipses being 3.~ months away at the other interval end. Obvious. Academically unseen = friendship review. And, if @tallbloke allows 😉 we can come back to the anomalistic cycle thing you suggested, from my POV the seven-fold connection in fig. 7.21 above holds the key that 239 anomalistic (240 – 1) is in 1 Saros and every 7 months the apse is opposite; the naked eye alone doesn’t see a difference between adjacent months (1 synodic). But corrections can be applied by comparison of the two adjacent quarterly moons (1/2 synodic), they show the line-of-apse direction to/fro apogee and come to sync, as was discussed on another thread, every 3 years in the wobbling plane; gee. all these methods, including Hoyle’s, require a high level of astronomical awareness and a grasp of some very abstract concepts including knowing where and when to first position the stones around the circle. I don’t buy this. It’s not so hard to observe the 18.61yr nodal cycle, because it coincides with the declination cycle. The ancients would have noticed that eclipses occur at fixed points in the declination cycle, and set the marker alignment with the Sun at a time of an eclipse, moving it three holes per year so it moves around the circle once every declination cycle. The annual cycle of the Sun is very obvious from the seasons, so moving the Sun’s marker two holes every 13 days so it went round once a year is easy enough. That just leaves the lunar orbital period = 2 holes per day – peasy. If they deducted 56 days every 56 tropical years they would be less than 3 days over the true nodal cycle x 3. So one day per year = easy-peasy version 2.0 – and we know they had two sets of 56 markers, one in stones and one for posts or the like. Two 5:12:13 Pythagoras triangles forming one rectangle i.e. the diagonal must be 13 as a proportion. OB: If they deducted 56 days every 56 tropical years they would be less than 3 days over the true nodal cycle x 3. Right, but since the nodical precession is represented by moving by one hole round 3 times a year, they’d only need to make a one-hole adjustment once every 122 years or so wouldn’t they? Two 5:12:13 Pythagoras triangles forming one rectangle? Yes, and the Prescelli – Lundy – Stonehenge 5-12-13 right angle triangle is amazing. It’s like they wanted to make sure the formula was never lost. A clue in the eternal geography. Or it was a symbolic gesture. A lot of effort for a gesture mind you! As a young lad living in Hawaii in the 1950’s I developed an intense interest in astronomy. The deep black skies over the islands at the time were filled with star specks and nebulae, and very little light pollution. It is the only place I’ve ever lived where one could watch stars and planets rise from behind the horizon. I also discovered Stone Henge at this time (the International Geophysical Year was in full flower) and wondered what it all might mean. I was about 11 years old at this time and I still recall concluding that Stone Henge as we know it is missing all its moving parts and I don’t recall anyone every suggesting what those parts might look like, but in my mind they would have worked like the hands on a clock and would have been indexed to allow calculations of positions of celestial objects, and to interpolate positions as objects moved relative to fixed points in the circles. I don’t think any discussion of Stone Henge can be complete without considering the missing bits. They would have made digging holes to compensate for changing time unnecessary. 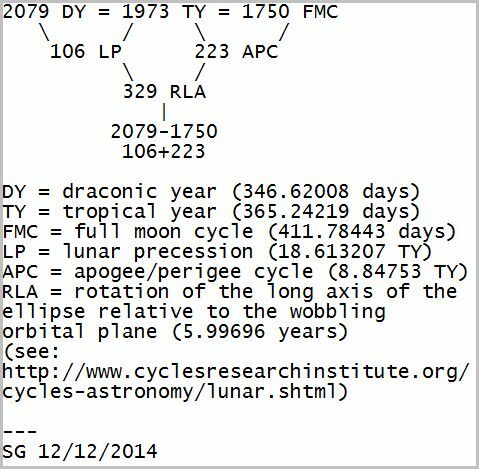 The Lunar nodal cycle of 18.6 years. The “moving parts” would be the marker poles representing these three cycles, shifted from Aubrey hole to Aubrey hole as time passes. I expect there would be other moving (or at least moveable) parts too. Maybe a ladder of levels for declination markers etc. Most all know that 3 units adjacent to 4 units, with a 5 unit completion precisely demands that the 3 units direction is orthogonal to the 4 units direction. Your 5-12-13 is another with the two lesser units orthogonal. A one milliradian angle is but back to back 1/2 milliradian angles, a ratio, or “relative to”. Whenever a triplet in two dimensions, (x units)^2 + (y units)^2 = (closure units)^2, defines the orthogonal x,y. Please scale “units”. until all of triplet units are integer. Wow, special relativity in two dimensions. What are you trying to demonstrate? Do the same thing in 23 dimensions, and you are somewhat closer to general relativity. The Hamiltonian requirement here, is that no mater how many orthogonal dimensions, at least one other non-orthogonal scalar is required to describe that dimensionality. I truly appreciate all effort on your blog to describe “is”, with no incompetent consensus., -will- . Many people suggest that Stonehenge and other megalithic structures were calendars for agricultural purposes however agriculture didn’t arrive in Britain until around 4000 BC so it suggests the original purpose for many of these Megaliths was the prediction of eclipses. An interesting programme can be found on the BBC archives where Prof. Alexander Thom is interviewed, it shows how backward some of the Archaeologists of the time were and interestingly even now we have new programmes on Stonehenge that ignore the astronomical alignments in favour of a healing centre or a prehistoric sound centre to enhance the sounds of harps and pipes. Adrian K: Archaeologists of the time were and interestingly even now we have new programmes on Stonehenge that ignore the astronomical alignments in favour of a healing centre or a prehistoric sound centre to enhance the sounds of harps and pipes. A Pythagorean set-up long before Pythagoras came along, as Adrian Kerton’s BBC link points out. OB: The Egyptians and Babylonians were doing this stuff looooong ago in laying out their temple structures. Once again, absence of evidence is not evidence of absence. Modern druids celebrate summer solstice at stonehenge because it’s likely ancients did too, and because it’s nice and warm and there’s plenty of people around who appreciate the ceremony. Anyway, we’re looking at this for the science, not the religion, fun though it is. @oldbrew: physical evidence is a bit stronger than “they [always] had a diet” or “pigs are [always] born” 😉 though for my mode of operation this can have infinitesimal little force as proof. What puzzles me is the shapes used for design of megalithic sites, in particular the horseshoe pattern; in comparison to complete rings this horseshoe sticks out. If the theory is really about lunstices (18.6 yrs) then we have to model the observer’s situation. Let’s define (so that premises offered can be charged with argument, aka claim and authenticatable evidence): lunstice is the time when the moon culminates higher than the sun, and we already know it does so in adjacent years (therefore we must pick one as pivot for future comparisons which [only then] gives us numeric results). Now it’s your turn please, devise an observation schedule for three or more lunstices, which can then manifest in stone for educating the future generations. Chaeremon. I think the horseshoe part of the complex is for solar observation, and the complete circle of Aubrey holes is for eclipse prediction/luni-solar timings. During the course of the year, sunrise takes place between a range of latitudes, but always towards the East. Hence the ‘incomplete circle’, or ‘horseshoe’. Note that in fig 7.11 above, the line indicating the North-South axis is angled off from vertical. If you turn the diagram so it is vertical, the horseshoe ranges from North-East to South-East. Is this evidence that sunrise was more important than sunset? Not necessarily. The stones might have been there to project the shadows of marker staffs onto at (or near) sunset. @tallbloke who said: I think the horseshoe part of the complex is for solar observation. I had to expect this, gotcha 😉 my response: so it is for lunar observation as well, since during eclipse days, determined by node markers, see fig, 3.6, both travel the ecliptic at the same angle (use 180° for full-moon, 0° for interlunium). Of couse I agree with the rest, sunrise and sunset have been cleverly taken into account for the shadow (think of not blinding the eyes). B.t.w. I observe sunset inside my living room on a wall where it is reflected by the small lake near the house, similarly with sunrise from the kitchen window+door towards the opposite wall. The winter solstice could well have been their New Year. We’ve moved it forward ten days. This also happens at Callanish and Carnac. What’s interesting is that the accepted average age for a human survivor in prehistoric times is around 30 years, too young to recognise a 65 year cycle, so the knowledge must have been passed on by poetry/stories unless the cup and ring marks were some form of record keeping. So perhaps Aubrey was correct linking the Druids with Stonehenge. The Druids took children and educated them from an early age allegedly by verse. Perhaps those verses allowed them to predict eclipses and it was this that allowed them to dominate the ancient Britons and it was therefore necessary for the Romans to wipe them out in order to gain dominance over the Brits. However this suggests the Druids preserved the knowledge long after Stonehenge ceased to be used, e.g. Stonehenge ceased use perhaps around 1000 BC and the Druids were wiped out around 60 AD. The fact that the horseshoe stones rise towards the winter solstice suggests this was the most important axis. Perhaps as in churches etc, one enters the monument opposite the most important feature, in churches the altar. Does this refer to Stonehenge and what happens every nineteen years? How about the Harvest moon being eclipsed over the Heel Stone? That would be quite spectacular. Adrian: there may have been four heel stones originally. ‘Extract from Burl – ‘The heel-stone is popularly thought to stand in line with the midsummer sunrise but it does not and never did… Astronomical analysis has shown instead that the stone is in-line with rising of the moon halfway between its northern minor and major positions’ (11). IIRC that view was supported in the History channel prog too. 19 years is the Metonic cycle of course. And here’s a ‘German Stonehenge’ on the same latitude as the English one. @oldbrew (January 11, 2015 at 4:42 pm) Goseck’s around the corner here. Though latitude is commensurate with Stonenege, I have’nt seen anything related to longitude (did you?). @ Chaeremon – just quoting the experts, maybe they should be clearer about what they mean? King Arthurs Hall, King Arthur’s Downs, Bodmin Moor (SX12967765). Visited 2nd November 2014. @oldbrew who wrote: @ Chaeremon – just quoting the experts, maybe they should be clearer about what they mean? Try it, for the 3 most recent and the next 2 occurrences; geo latitude exists around the world (literally) so that should not be impossible. B.t.w. thanks much for the other 56 flat slab stones, good to know. Yes there were, and excavation have shown a number of post holes in the region of the Heel Stone. Actually, the ‘bank’ was a by-product of digging a ditch or moat around the henge. Its use would be to provide a level plane for taking measurements from. Water finds its own level. Note that 2 adjacent 28 subintervals will advance the lunar display from near spring to near solstice to near autumn (etc) in the same order as the seasons. The difference in display size (lunar diameter and magnitude) is not so easy to compare for the naked eye observer over longer temporal distances, but the difference between two adjacent quarters is easier to recognize and gives constraints to the appearance of syzygy between them. The number of full moon cycles (FMC) is 7517 – 7014 = 503. So 501 sets of 14 SM give 503 FMC i.e. ‘2 extra’ compared to ‘1 per 14 lunations’. 7013 SM is a shade over 567 years and one more SM is needed to complete the period. Chaeremon: notice the 358, that’s the Inex period (358 SM). 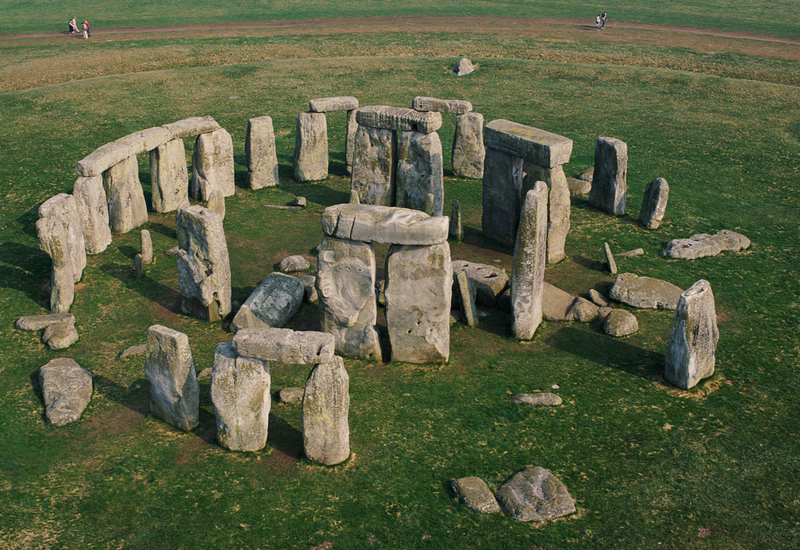 ‘The buried remains of a mysterious giant prehistoric monument have been discovered close to Britain’s famous Stonehenge heritage site, archaeologists said Monday. This interval has either eclipses at both ends and/or the quarter before and the quarter thereafter show virtually the same time of day, accurate for 6¾ years (equinox <-> solstice) and the lunar display has 90° offset by the quarterly interval ends in the ecliptic (and of course from the Sun at the day of observation). Half that period = 1868 anomalistic months (21 x 89,-1) = 1743 synodic months (21 x 83). The tablets look interesting, but tricky to understand. @oldbrew said (September 14, 2015 at 8:58 pm): The tablets look interesting, but tricky to understand. Secrets of Stonehenge discovered because ‘a hose was too short’. Archaeologists have also identified three holes where missing stones would have stood on the outer sarsen circle – evidence, it is believed, that the circle was indeed once complete. Surprisingly, even the most sophisticated surveys failed to spot them. Two members of staff noticed dry areas of grass, or parchmarks. If Dodwell’s claim from another thread is factored in for the parts that date before 2345BCE. does that come up with any interesting alignments?. Good question. Don’t know the answer. “Initially an area for burial—” The burial seem to date to about or before 3000BCE. 3195BCE is a cataclysmic (from dendrochronology) era and mass burial at that time have been noticed elsewhere. Cult, or something very different, a necessity brought about by some Sendai-like event? Then “what would drive a people to move such massive stones”? What makes us today spend so much time and money to study global warming and climate change, or large wayward comets? Was it to study what they saw as a source of life threatening disasters on a major scale? Would we do it to adore some fat-assed statue. If no I bet neither would they. One thing is sure, they were sensible. Last “lead a leader to be sacrificed”. We don’t do it today (though perhaps some should be— with hemlock–Athenian democracy). Ergo. But where are the astronomers? A past question of mine was: ‘how could the natives congregate at stonehenge for the celebration of the solstices, without a calendar to indicate the precise date?’ How could they tell the actual solstice day in advance? When we today don’t seem to have the means. Unlike the equinox, the solstice time is not easy to determine. The changes in solar declination become smaller as the sun gets closer to its maximum/minimum declination. The days before and after the solstice, the declination speed is less than 30 arcseconds per day which is less than 1⁄60 of the angular size of the sun, or the equivalent to just 2 seconds of right ascension.” Today it is known with some accuracy only after the event. Geologists put a spanner in the works of the Welsh quarry theory. Were stones at least partly moved by ice? One can only imagine the technologies and science of a civilisation that seems to be world wide from all the sites that continue to be a puzzle to all the pundits. The maths and measuring systems would appear to be superior to ours in that they related to the harmonics of our world and the universe. Wayne J: One can only imagine the technologies and science of a civilisation that seems to be world wide from all the sites that continue to be a puzzle to all the pundits. Well the most impressive piece of technology from the ancient world found so far is the Antikithyera instrument, which is made of bronze clockwork, so don’t get too excited. The maths and measuring systems would appear to be superior to ours in that they related to the harmonics of our world and the universe. I do like the idea put forward that the megalithic yard is defined by a pendulum of 1/2my length that oscillates 180 times (360 swings) during the passage of a star across the top of two points (sticks or standing stones). This reconciles gravity, distance, angular velocity and time. It’s also reproducible anywhere you can find sticks, stones and string, without the need for a druidic standards agency rep travelling around with rulers for henge builders. Very neat. No not all. Look here, plain, simple, mathematical and with exceptional results. That technology would show differently at the latitude of stonehenge, but be sure, it was well diffused. You can readily see the development. The structure is a camera obscura, 4k years before Aristotle. Quote ” the most impressive piece of technology from the ancient world found so far is the Antikithyera instrument, which is made of bronze clockwork, so don’t get too excited.” I would like here to see the machinery that made that possible, since there is no hint of that historically (I may have to stand to be corrected here). Nor the development of the bronze plate. In bronze numismatics the source of the ore of the coin can be known, and its age. (the megalithic calendar belongs to the stone age, no doubt about that. The other thing still bothers me). There is no reason why it should not be checked. To me the maths of the mechanism seem easier than the manufacture at that particular time. The full development of tools and mechanism, from ore to finished product, cannot be the work of one man, in one lifetime, and at that era. OldmanK, of course you’re right, that the megalithic astronomical temples themselves are a remarkable technology. Rhodes was a centre for bronze clockwork. The Romans pillaged some automata and bigger versions of the antikithyera instrument from there. I suspect the gears were hand cut. The technology was in the precision of the marking out equipment that must have been used. Artisans are inventive. When I visited Rhodes town, I was shown down under one of the old buildings, which was not a mere cellar, but another building, with more steps leading further down. The City was ruined by war several times, and rebuilt on the ruins, with rubble raising street levels each time. Those are representing the generations of artisanal technology passed on father to son which culminated in the automata and astronomical measurement devices the Romans took home. I’ve visited the megalithic structures on Malta too. Is it your book you linked to? I’d love a copy to review. tallbloke, thks for the reply. And yes, can be arranged. You have my e-mail, please send a pm.